Explanation: Yesterday, astronomers announced the discovery of the first system of planets around a normal star other than our Sun. Previously, only single planet star systems had been found. Subtle changes in the wobble of Upsilon Andromedae, a Sun-like star in the constellation of Andromeda, allowed astronomers led by R. Paul Butler (AAO) and Geoffrey W. Marcy (SFSU /UCB) to make the breakthrough. This star system is quite different from our own Solar System, however. All three detected planets have masses near or above Jupiter. The discovery implies that multiple-planet systems are quite common, increasing speculation that life-bearing planets similar to Earth may one day be found. The drawing above is an artist's depiction of the Upsilon Andromedae system and its innermost planet. 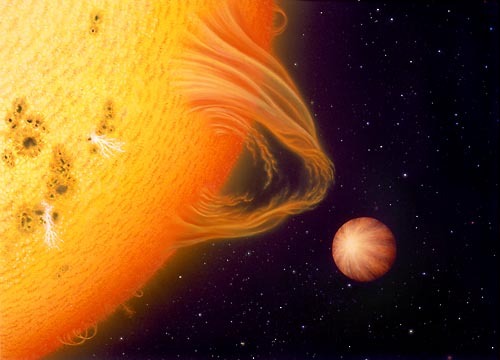 This planet orbits unexpectedly close to its parent star.